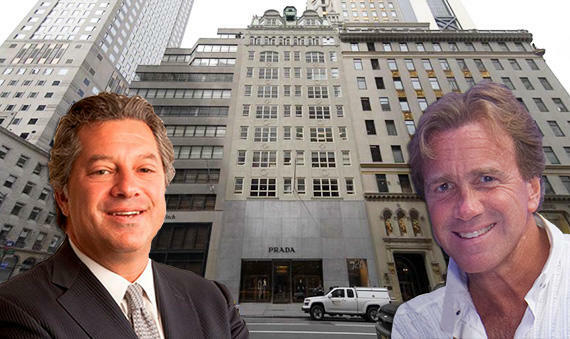 SL Green Realty sold its 50 percent stake in 724 Fifth Avenue to partner Jeff Sutton for net proceeds of $85.5 million, the company announced Monday. As part of the deal, Sutton also paid back SL Green’s “investment” in 720 Fifth Avenue and paid off part of another unnamed loan, according to the release. SL Green issued a $33.75 million mezzanine loan on 720 Fifth Avenue in 2016. Sutton and SL Green brought 724 Fifth Avenue, a 65,000-square-foot retail and office property, for $200 million in 2012 and last year refinanced it with a $235 million loan from Aareal Capital Corporation. Prada occupies 15,540 square feet of retail space over four floors in the building and reportedly pays $19 million in rent per year under a lease running through 2028.